It’s no secret that we’re heavy proponents of dual monitors, but this setup goes even further: this is a MacBook Air 11″ model driving 4 screens! OK now a few of the screens are really just for novelty, but this setup looks cool regardless. That little tiny screen below the Apple Cinema Display is a MIMO UM-710S USB Powered 7 Inch LCD which apparently has a 800×480 resolution. It looks like it’s running an IRC client but a screen that size would also make for a good full-time Twitter, iTunes, or news feed display. 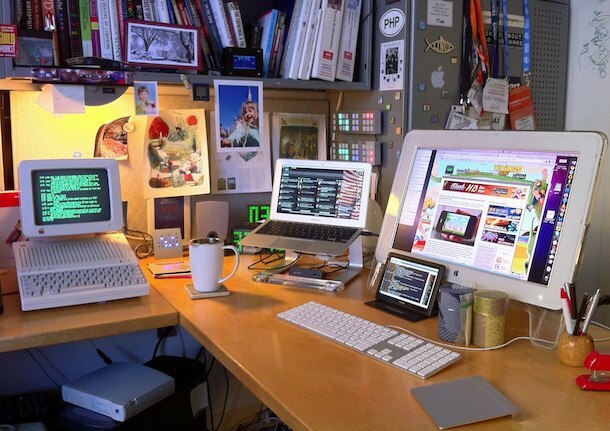 The picture is from CultOfMac, and they say the Apple IIc on the far left is powered through a USB to Serial adapter. The MacBook Air 11″ is clearly serving as the primary machine here, something that many critics argued the 11″ wouldn’t be powerful enough to do. Nonsense, just hook up an external monitor (or 4) and you’ve got yourself a workstation!